Iterating on a native content experience. In 2017, BuzzFeed made a commitment to vertical video. The format was proven to be an effective content experience on BuzzFeed's distributed platforms and we wanted to evaluate whether it would perform directly on BuzzFeed's platform. The team launched this feature on the iOS app in the fall. Shortly after, I joined the team to iterate on this feature and define its place in the app feed. Role: Design lead collaborating with a product manager on defining product vision, strategy. Owned all designs and execution. Stories was the first content type that was supported exclusively in the BuzzFeed app. Prior to launch, the app and the site closely mirrored each other in feed, content and experience. In addition to aligning with business objectives, the format had potential to open up unique ad distribution opportunities. When I joined the project, our team's mandate was to determine if we could make the format a success or learn from the experience and move on. At the onset of the project, we didn’t have a clear mission or specific goals. Since the project had been conceived to achieve primarily business objectives, it was challenging to understand what user problems it was trying to solve. Without concrete insights, we went back to users. Our goal was to understand how users perceived this feature and their affinity towards it, and uncover any usability issues that users may have. In this study we learned that discovery of this content was a challenge. Users didn’t understand what this feature or content was and what would happen if they engaged with it. In the feed it just appeared to them as another piece of content. We knew we had to start there. In a previous research study, we evaluated the role of the app for our users using the jobs-to-be-done framework. From that study we knew that stories would address one of the jobs to be done, primarily fulfilling the 'BuzzFeed Break' where users sought out the app for quick consumption experiences where they could be entertained or informed quickly. In the same research study users also expressed a desire for more curated content by BuzzFeed. These two insights would help us reframe the feature with a clearer path forward. With everything we knew, our objective was to clarify the value proposition of stories to our app users and make its consumption a daily habit. But we also knew that the experience of the feature was only part of the picture and the content was just as important. We identified a few key stakeholders from the social curation team to join our working group and collaborate on solidifying the content strategy. Based on the insights we gathered, we knew that users wanted an experience that they could consume quickly but that was also curated by BuzzFeed. In a mini sprint, we brainstormed content ideas and decided that we would reframe a story to be a collection of highlights of the day presenting the best of BuzzFeed. We started to define the roadmap for iteration from the content strategy. We knew we wanted to focus on conversion, retention and unique views while continuing to monitor top line KPIs. Over the course of several months, we released a series of experiments to alter the presentation of this content in the feed as well as the surrounding feed elements. 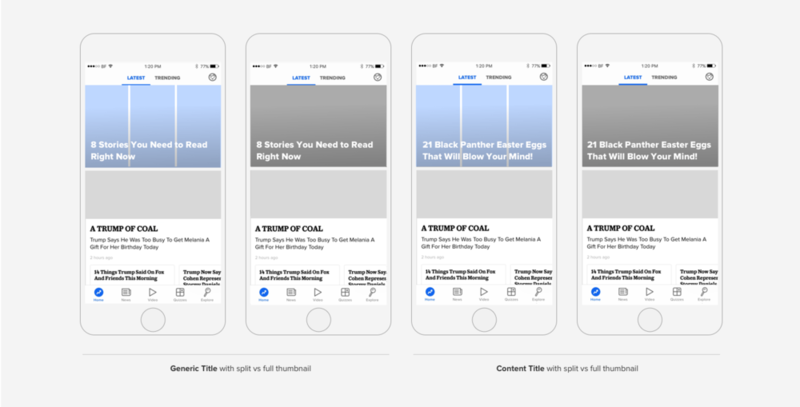 In addition to refining the stories content, we built curators a testing framework to compare title and thumbnail variations so that they could better understand their impact on conversion. Through experimentation with content, we learned that content titles converted better, but led to lower retention and completion. When we used consistent titles day over day retention was more stable and users completed more of the content. In favor of increasing conversion adoption to the content type, we updated our editorial strategy to lead with content titles. In 4 months, we managed to move our metrics in a significant way and surpassed some of our initial goals. We found that the changes started to make positive impact on global KPIs by improving both D1 and D7 retention. Stories is now exposed to the full app audience and the team is now focused on the experimentation and roll-out of multiple stories.